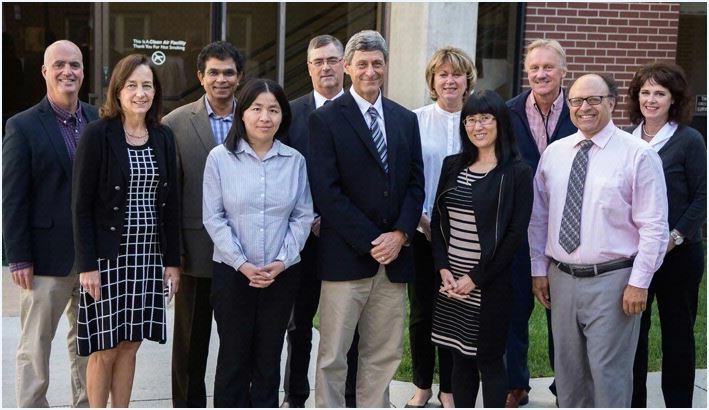 *Some of the steering committee members of the Great Plains IDeA-CTR Network include: (left-right) Ted Mikuls, MD, Ann Fruhling, PhD, Ashok Mudgapalli, PhD, Fang Yu, PhD, Jim McClay, MD, Matt Rizzo, MD (Principal Investigator), Mary Cramer, PhD, Shinobu Watanabe-Galloway, PhD, Risto Rautiainen, PhD, Howard Fox, MD, PhD, and Karla Klaus. NOTE: Dr. Fruhling is from the University of Nebraska at Omaha. All others in the photo are from UNMC. Those UNMC steering committee members missing from the photo are: Paul Estabrooks, PhD, Lani (Chi Chi) Zimmerman, PhD, Jane Meza, PhD, and Babu Guda, PhD. In addition to partnering with pharmaceutical companies to bring the latest clinical research studies to our patients, our faculty are actively engaged in investigator-initiated peer-reviewed research in order to advance knowledge and improve care for neurological disease. Our physicians and scientists are the initiators and principal investigators of the following research grants. Funding Source: Toyota Motor, Inc.
Funding Source: Toyota Motor Engineering of North America, Inc.
Funding Source: Nissan Motor C, Ltd.
Funding Source: Nissan Motor Co., Ltd.